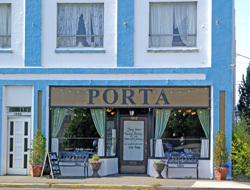 In the brief time that Porta has been around, it’s earned a fine reputation among south coast dining enthusiasts. and always looked busy when we passed by, so we looked forward to trying it ourselves. Good friends Stephen and Eve Thompson (Steve is the best digital photographer I know, and has taught me a LOT) forwarded this photo of a weird mushroom – well, we guess it’s a mushroom – which they found growing in their greenhouse in mid-May. 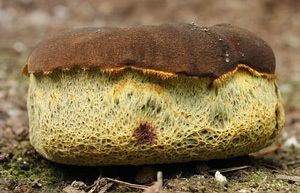 It looks like some variety of Suillus (the Bolete’s illegitimate brother), but – gee, where’s the stem? The answer is, there wasn’t one! We know, because we went over there and looked for ourselves. Even when we plucked it, there was nothing even remotely resembling a stem. Photo courtsey of Steve Thompson. 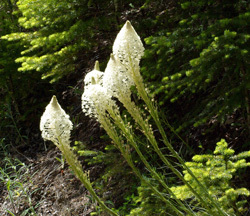 We never notice it unless it is blooming, but in spring time, usually mid to late May, there is usually some Bear Grass (Xerophyllum tenax) growing in the hills above the coast and, more abundantly, in places in the Cascades. Here on the coast, it’s just for show, and it provides a good one: about 2 feet tall, with its white flowers, it’s a striking sight. The books tell us it only blooms once every several years, but what that means is, each individual plant only blooms once in several years; some plants will bloom each year. The books also describe the fragrance as sour, but at least our coastal varieties (we never noticed this in the Cascades) have a fresh pleasant odor, and we cut a bouquet this spring that we’ve enjoyed well over a week, with no sign of wilting. One spring a few years ago, there was an unbelievable blooming of Bear Grass on a near-by clear-cut that was then 2 or 3 years old. The stuff was absolutely everywhere, and we have never seen anything like it since. 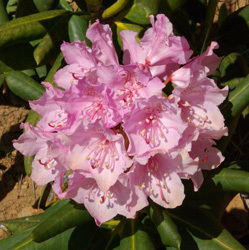 We didn’t think 2008 would ever be equaled in the Rhododendron department, but 2009 is shaping up to be every bit as good. The South coast is awash in them, and they are at their peak in the last week of May. Cultivators crimp off the blooms to train the plants to grow more of them in the future, but all of ours are wild and most are covered with blooms despite our refusal to indulge in such foolishness. "Big and Beautiful" best describes the 2009 rhodie season. 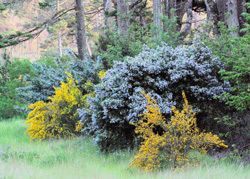 Anyone who visits the south coast in May can’t help but notice these lovely, large bushes, with their lustrous blue flowers. Known by many names, the scientific among us call them Ceanothus thrysiflorus; they’re a wild lilac, with a pleasant fragrance, and the deer seem to be fond of them, especially at this time of year. The popularity among deer is an explanation for the common name “Buck Brush” or “Tick Brush,” the latter due to its reputation for holding and transfer of ticks among deer. It is often incorrectly called Chinquapin. The most popular common name locally is probably Blue Bud, and that seems right to us. Highway 101 South at this time of year. Cheri Authement's submission to our recipe contest, Tangy Turkey Breast, has turned out to be a favorite entree for us. It's a delightful presentation that can be enjoyed year round, not just at holiday time. And, since we're living in the middle of cranberry country, we appreciate the fact that it highlights a local product. Try it - we know that you'll love the ease of preparation, the flavor combinations and the rich colors of this dish. breaking thru the woodland duff.